The rent at Centerpoint Apartments ranges from $729 for a studio to a $839 one bedroom. Apartments in this building are about 35% less expensive than the Dallas average. This apartment is in Dallas. The closest park is Timberglen Park. Centerpoint Apartments has a Walk Score of 42 out of 100. This location is a Car-Dependent neighborhood so most errands require a car. Of all the apartment communities out there, we are one of the only ones who can actually say that we have managed this property ever since we built it! That is what makes us different. That is what makes this community special. At Centerpoint, we take pride in our building and its legacy lives on through the people who call it home. *Offer expires if you leave the property. Explore how far you can travel by car, bus, bike and foot from Centerpoint Apartments. Centerpoint Apartments has some transit which means a few nearby public transportation options. Car sharing is available from RelayRides. 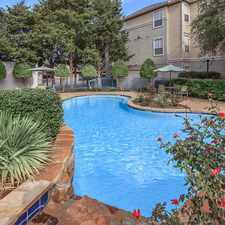 Centerpoint Apartments is in the city of Dallas, TX. Dallas has an average Walk Score of 46 and has 1,197,816 residents.